I am keeping this blog post short and sweet…well, at least I will try to. Life definitely got in the way of things this week with some major distractions and, unfortunately, they had nothing to do with weaving. I feel like I have been walloped and am, just like in the cartoons, seeing stars…. By coincidence the little bit of weaving I did this week just happened to involve stars. Following on with my new love affair with the weaving of Tinkipaya in Bolivia, I tried another of their pretty motifs, which I had thought were flowers, but which, according to Cereceda in her book which catalogs the designs on these textiles, are ch’askas, stars, and are a representation of the world above known as janaq pacha. 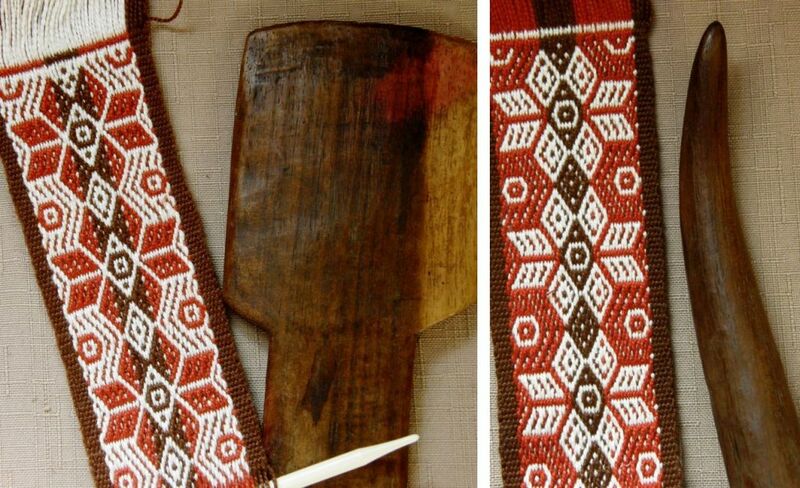 The small band I wove to test the pattern is pictured above with a couple of wooden tools I got in a market in Potosi, the province in which Tinkipaya is located. I was told that the tool on the left is used to push down the warps behind the heddle rod when the weaver is opening the heddle shed. I have never seen a weaver actually use one of these. The one I have has a red stain and I like to think that it might be cochineal from one day when its owner was preparing to dye. The other tool, of which you can only see the tip, is used for beating and strumming and I have seen these in use in several places in Bolivia. I saw stars when I first saw this pattern but its creator, Kurt Laitenberger who designed it for tablet weaving, calls them flowers. I wove them into what I call my ‘Starry Night” wall hanging. I remember stepping outside my little room on Taquile Island on Lake Titicaca to go to the bathroom on a clear and bitterly cold night and being stunned and almost knocked over by the brilliance and abundance of the stars in the black black sky over that dark little island. One day the children were taken and placed like stars in the heavens and this is why women cry out about stars in their weaving. The stars not only speak of the sky but also about the richness of nature because one woman, in an attempt to stop her child from being taken, grabbed hold of a finger (or toe, it is not clear in the Spanish translation which). As she pulled on the finger, unfortunately, a piece broke off and this piece was buried. From the burial of this piece a corn plant sprouted. 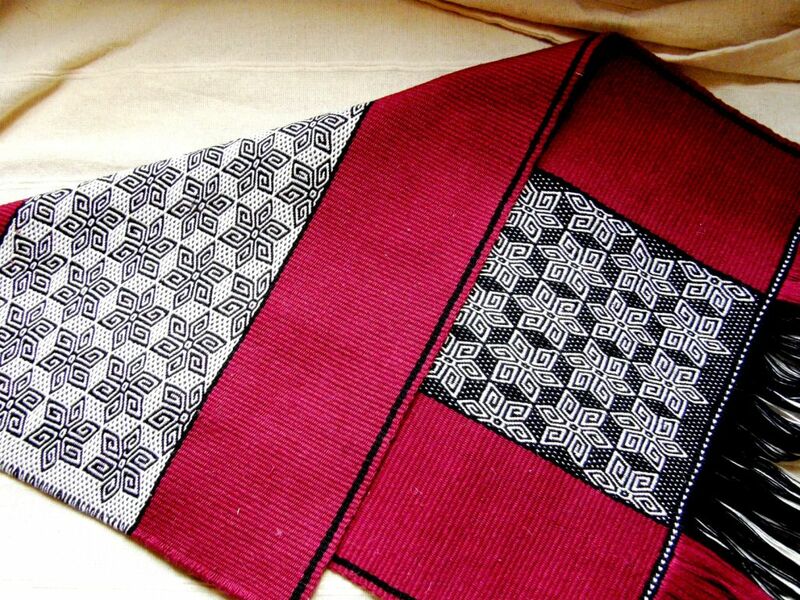 In this way, weaving symbolizes abundance which comes from the piece of the child. And this is why food crops are not only considered elements that feed and sustain men, they are part of Man himself just as the stars are part of Man and Society. Songs name those who are living in the sky and those that sing wear woven cloth to show that they are still with them even though they are distant. Wikipedia tells me that the stars on the flag of the United States represent the fifty States in the Union. Well, I knew that. I was hoping to find out why exactly stars had been chosen as opposed to some other figure. There doesn’t have to be a reason. I am sure that we could all come up with some kind of symbolic meaning for a star. 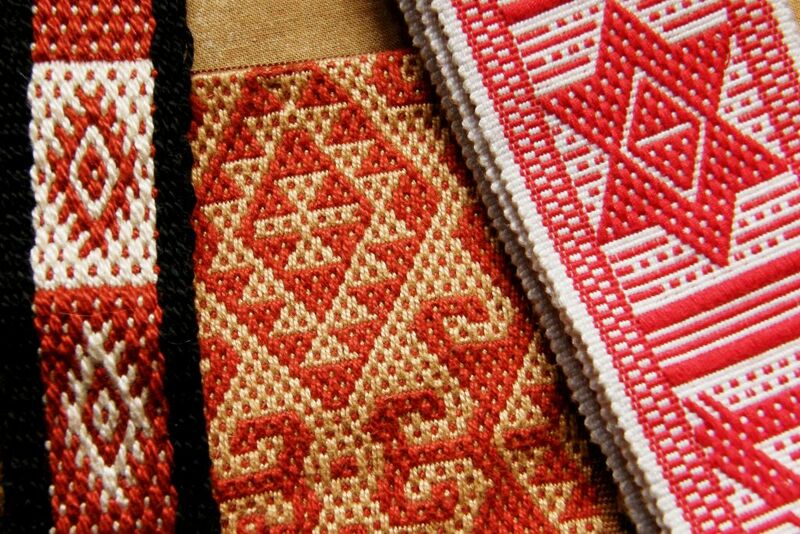 I swear that some weavers I have spoken to have made up things about the motifs they are using just to please or have a bit of fun with me…I have seen the twinkle in their eyes and the way they look sideways at each other! 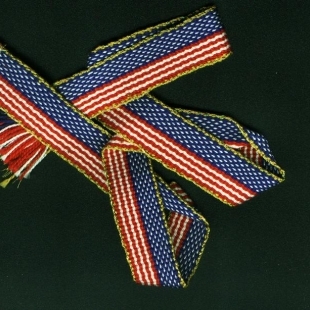 Gail from Weavolution wove this very patriotic collar for her dog on her inkle loom. She is forever coming up with clever designs for what must be the best-dressed dog in New York. 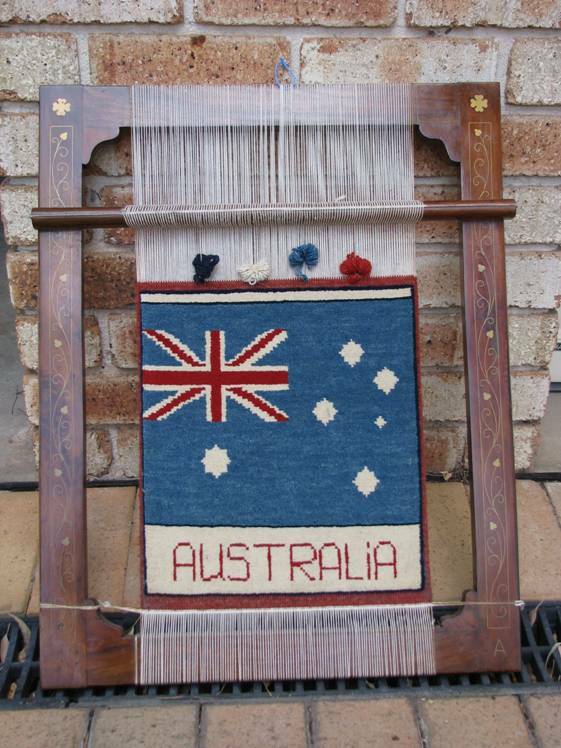 Speaking of flags and patriotic weaving, I assume that the next starry piece was made by someone who is proud to be Australian. The group of stars is the Southern Cross constellation which really is a sight to behold there in the southern sky. I am so happy to be able to see it low on the Bolivian horizon and it makes me feel somehow connected to Australia and the people I know and love so far away. It is little wonder we so love stars and choose to use them in our cloth. The large single star, which should only have seven points, represents the Nation’s seven states and territories. This cut pile piece on its beautiful frame is gorgeously dense and I would love to meet its creator. It was given to my brother as compensation from the Indian owner of a furniture store who went out of business before he could supply all the chairs for my brother’s dining room setting. He then gave it to me. One day I will track him down and see if I can talk to him about this weaving technique. I don’t know if the weaver intended to continue with the design. There is so little space at this point and the tension on the warp is so high I can hardly imagine being able to do so. 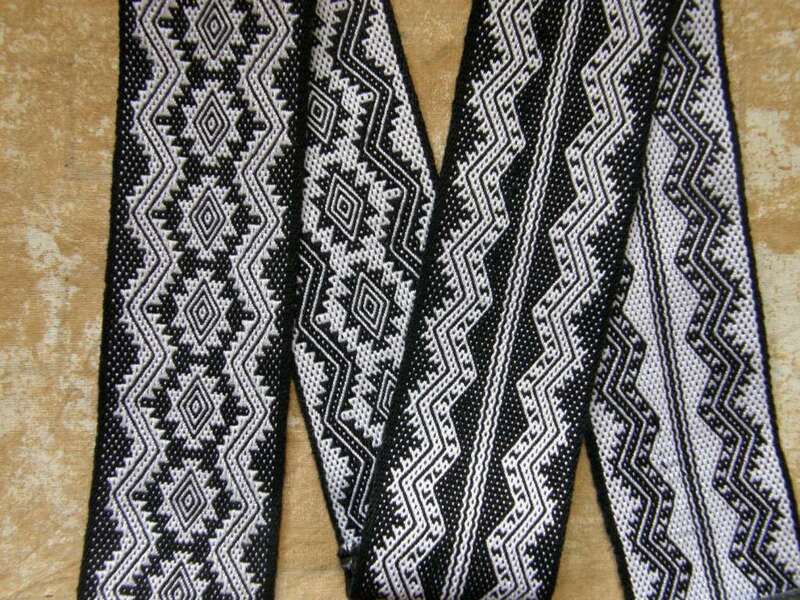 There are a lot of representations of stars in Andean weaving. 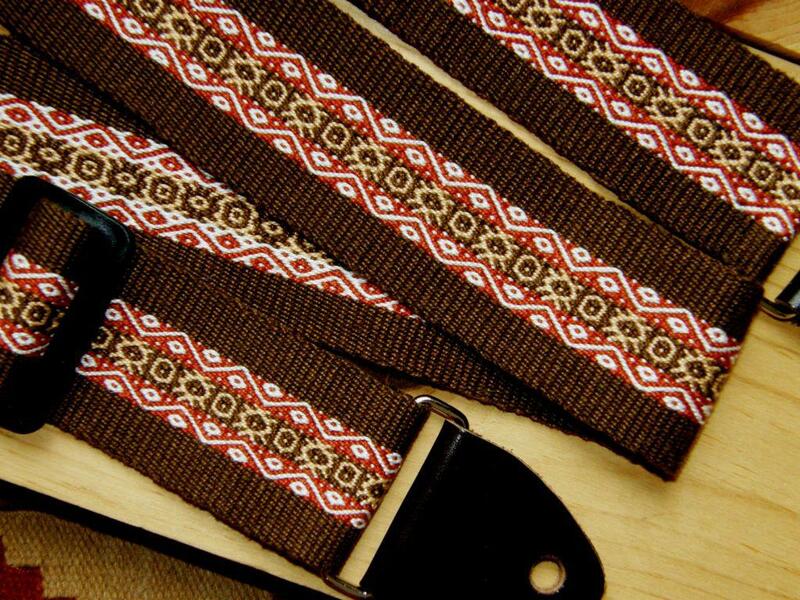 I took one small motif and combined it with others to make a guitar strap in colors reminiscent of the desert and canyons of the US southwest with a winding river, moon and stars. It took me back to clear, warm nights camping in the depths of Utah canyons with nothing between me and the stars, moonlight bouncing of red canyon walls and with dozens of frogs “ribbeting” away at the waters’ edge. And then there are motifs that look like stars to our eyes and maybe one day I will find out what exactly they mean to the weaver. There’s an Andean ch’aska on the left with star-like motifs from Central Asian textiles and a motif on a belt from Ecuador on the right. Enough star gazing…let me show you what Camilla in Sweden made with her pebble weave band…a hair band for a friend. She attached elastic to the ends and covered it. What a sweet project for a band. Ad here is what Karina in Chile wove using the Bolivian llama patterns that I embellished and charted. They are woven in warp-faced double weave the instructions for which, along with the llama pattern charts, are on this blog. The uppermost llama is standing beneath a starry sky. I love Karina’s clever wrapped-warp and pom-pom finish and the braids at the top are a nice touch too. It makes a lovely wall hanging. It’s nice having these projects to show from people at opposite ends of the globe…how we all come together with this same love of weaving! As for the thing that had me distracted this week….I have to keep my chin up or I won’t be able to see the stars. P.S. Your work is jaw-dropping gorgeous as usual!! you are one of the strongest women I know……I know that whatever the challenge is…you will rise to meet it…. Thinking about you! I haven’t been around as much as I have had life takes some inateresting turns as well but know that I read the blog and keep up with you. 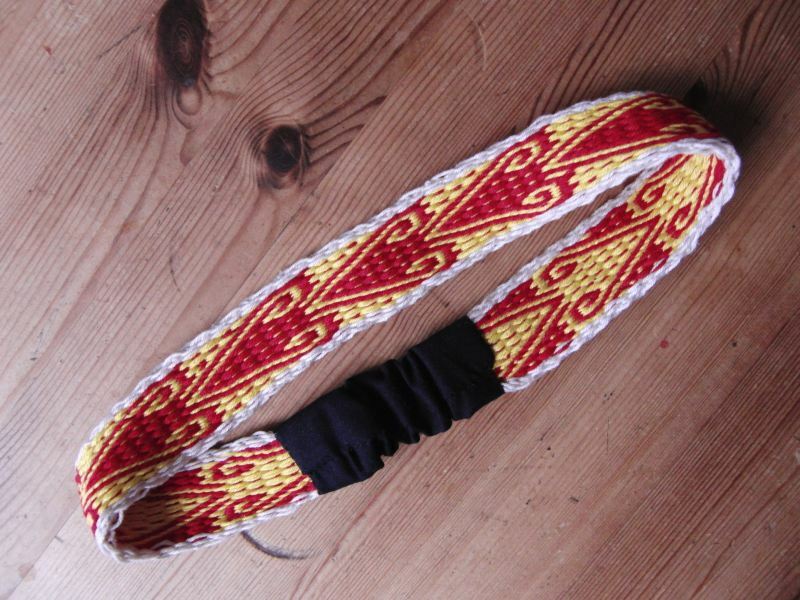 I will some my blackstrap weaving next week. It has t too long. Know that’s you are my inspiration and mentor. If you EVER need a thing you have only to ask. What is mine is yours for the asking. Hope things start looking up for you. Now take a deep breath and remember that you are a shining star to the whole weaving community. As always, your work is so inspiring! One explanation for the number and variety of star patterns I heard in Turkey was the obvious: weaving is easier to do with geometric shapes. 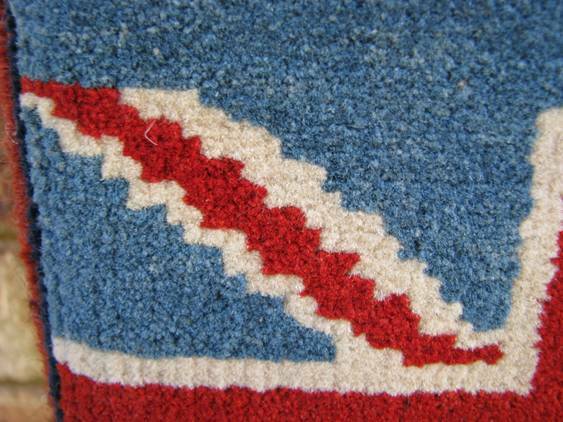 I agree with you about that inlaid loom and the cut pile carpet work. I do a bit, but not on such a beautiful loom! Laverne, my thoughts are with you and I hope things will go beter. Thank you for this beautiful stars and flowers, the legend is really moving.You are my weaving inspiration! Your give us such lovely images, ideas and thoughts in your blog. I especially love the star designs. I hope one of the stars is a guiding star to lead your life back on track again. My heartfelt thanks to all of you for your very sweet and thoughful comments. Thank you so so very much! 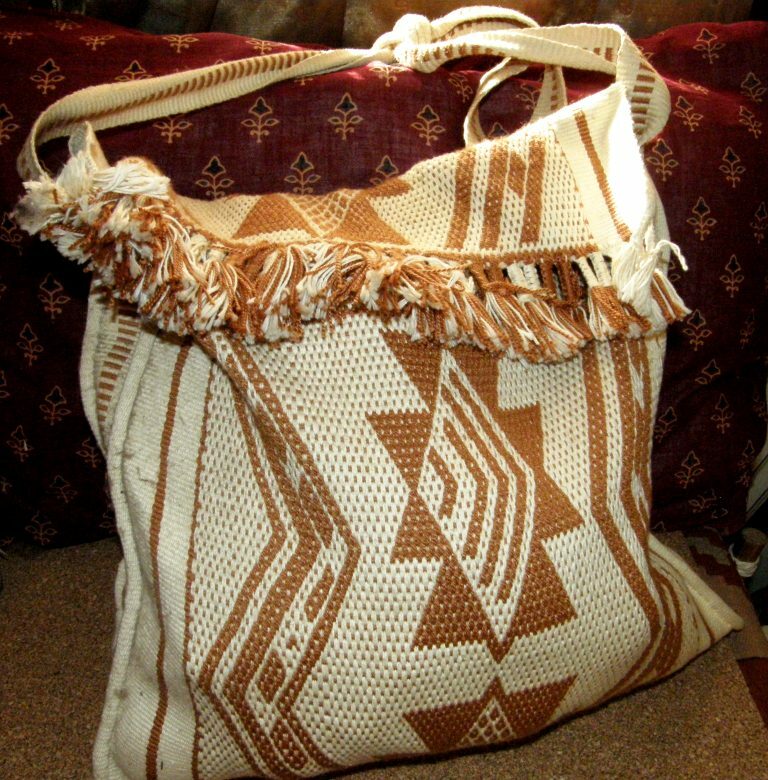 Hang in there and find solace in your beautiful weaving.